It's not easy to answer the question of how to tell your child you are getting a divorce, but we're here to help. Here's a guide on how to do it. It's no secret that divorce can have a big impact on children. Divorce can bring about many changes that can take time for children to adjust to. These can include traveling between two different homes to custody battles. One of the hardest parts of divorce is knowing how to tell your child you are getting a divorce. 50% of all North American children deal with their parents getting a divorce. But just because it's common for kids doesn't mean it's easy to deal with. In this article, we'll share tips and best practices for how to tell your child you are getting a divorce. By following these tips you can get them through the process in the best way possible. You shouldn't discuss any adult details about your divorce children if your children are too young to understand. They won't know what you're talking about, and you could upset them by telling them too many specifics. They shouldn't feel you are burdening them, badmouthing the other parent, or trying to make them think a certain way about the situation. You should just tell them what they need to know about your divorce and do it in an easy and digestible way. You should answer any questions they have about where you'll be living or how often they'll see each parent. Try to keep the focus on the kids, and not on the adults. When it comes to how to tell your child you are getting a divorce, you need to make sure you're on the same page with your spouse. You can do this by setting clear and agreed upon expectations and boundaries about the divorce. If you and your spouse say different things about your divorce, your children will end up upset and confused. You and your spouse don't have to agree on everything. What matters most is that you're on the same page about the big things. You and your spouse may not be happy with each other or agree on the reasons for your divorce. Maybe one of you blames the other for the separation. Your children don't need to know any of this. If you place blame on your partner, your children may pick sides or be angry and upset with them. This can be very unhealthy for children, and really damage their relationship with you or your partner. So when telling your children you're getting a divorce, keep your thoughts and feelings to yourself to keep things civil. You should also only use productive and positive language when talking about your spouse. This will keep things calm and positive for everyone involved. One of the most important tips for how to tell your child you are getting a divorce is telling them that they're not the reason why you are getting a divorce. You should give them a reason for the separation that is easy to understand and clear like "we grew apart". Children often will tell themselves it's their fault the parents are getting divorced. So you need to take the time to explain that the decision has nothing to do with them. You should also tell them that the divorce won't impact the love you feel for them. Don't tell your children you are getting a divorce unless you know you're going to go through with it. The last thing you want to do is put them through that kind of stress and then take it back. In general, it's best to wait until you have already signed a divorce agreement with the custody arrangements, or after one of you has moved out. You should pick a time when you and your spouse are mentally and emotionally ready to support your children through your divorce. It's also best to wait until you have a support system in place for them. You should tell family members like aunts, uncles, and grandparents, as well as their teachers and family friends, so they can support your kids. Try not to tell your children during a time of high stress like graduation or exams. And whatever you do, don't tell your kids without your partner present, as that's not fair toward your ex or them. 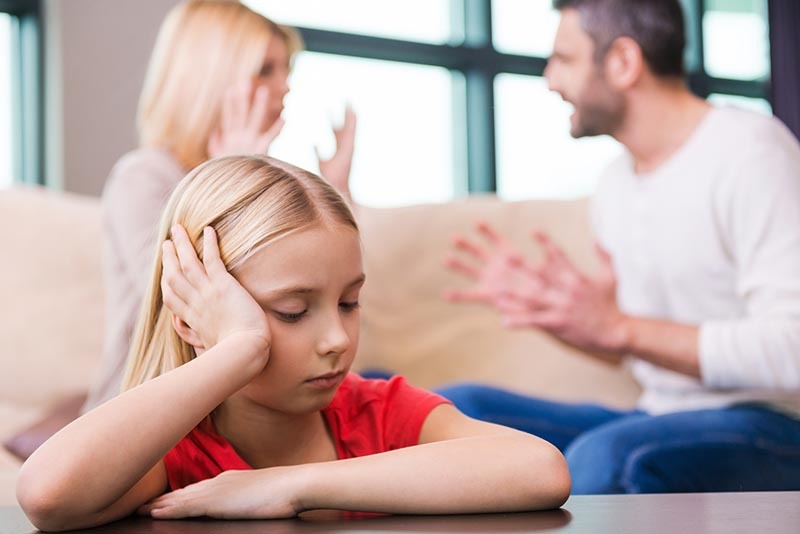 Divorce can be a strange and confusing concept to kids, so it's important to be as clear and specific as what your divorce will mean to them as possible. Your kids need to know that there is no chance that you and your spouse will get back together. You also need to walk them through how your divorce may be unlike the divorces of other parents they may know. Your kids need to know what to expect for the future when it comes to things like school and where they'll be living. Give them specific information and make sure that what you're telling them is consistent and true. Don't make promises that you can't keep, and stay true to your word to keep them feeling safe and secure. Telling your children you and your partner are getting a divorce isn't easy. There isn't a one-size-fits-all approach for walking them through such a sad and uncertain time. And every child responds to divorce differently. Knowing the right thing to say isn't easy. But if you follow these tips, you can tell them in the easiest and safest way possible. And you can make sure they'll be prepared to deal with the tricky times ahead. Are you and your partner thinking about getting a divorce? Do you need to get in touch with a divorce lawyer? Are there any tips we missed? Let us know in the comments! This entry was posted in how to tell your child you are getting a divorce by verhaeghelaw. Bookmark the permalink.